Dr. Gordon discusses how to decrease the risk of getting breast cancer, factors that influence risk and methods to find it as early as possible. 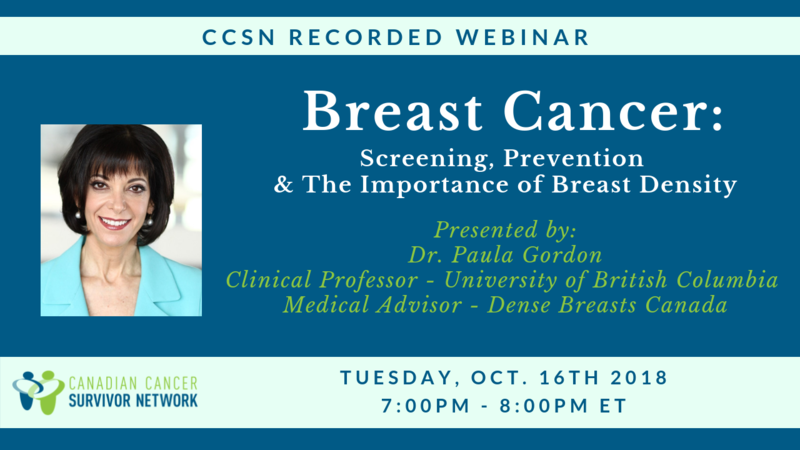 This webinar was co-hosted by our partners at Dense Breasts Canada, and there is a particular focus on the importance of knowing your breast density. Dr. Paula Gordon is Clinical Professor at the University of British Columbia, and works full-time as breast radiologist, reading screening and diagnostic mammograms and performing image-guided breast biopsies. She is passionate about finding breast cancer early to decrease deaths from breast cancer and allow less aggressive treatment. The webinar was followed by an interactive question & answer session.